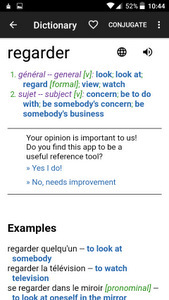 Ascendo’s Fre-Eng Dictionary + Android app is a bilingual dictionary that includes a variety of language tools to help you understand, pronounce, and practice French or English vocabulary, phrases, and verbs. It’s equally useful for speakers of either language. You look up words in the dictionary by typing in the search box – each letter refines the list of words underneath, so you can find the word even if you’re not sure about its spelling. 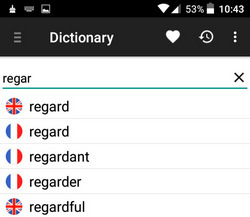 The word list is bilingual with a little flag icon next to each word to let you know whether it’s French or English. One thing I don’t like is that there is no “enter” button – even if you do know the exact spelling, you have to tap the word in the list, which sometimes leads clumsy people like me with "fat finger syndrome" to end up on the page for the word just above or below the one I wanted. The free version of the app has ads, which are fairly intrusive and difficult to close (tiny "x"). The ad-free premium version offers the option to add words as well as an extended dictionary (625,000 entries), verb conjugator (6,400 verb tables), and phrasebook (250 French and English expressions divided into 20 categories). Buttons for text-to-speech pronunciation with adjustable speed are available in every tool (this requires installation of a local TTS engine). All in all, Ascendo’s Fre-Eng Dictionary + is a handy Android app for native speakers of either French or English who are looking for quick translations and conjugations. Previous C’est le pied !